I've been asked to give more photography portrait tips related specifically to posing techniques of individuals. Here are three more posing tips. Just like any other tip on taking digital photography, they are subjective and it never hurts to experiment and break the rules of composition and see if you like the results. Usually it's not a good idea to have your subject stand directly facing the camera. Placing them on a 30 to 45 degree angle makes your subject more attractive from the camera's view. It also offsets the shoulders so that they are not at the same exact level in your photograph. Also note that I had my model's head turned slightly to the side and not directly to the camera. It is not exactly in line with her shoulders and not exactly in line with the camera. And finally, my model's arm is also bent at an angle rather then straight down at her side. It's always desirable to make your subject look their absolute best. In our western society, "thin is in" and clients like to be portrayed in a slender fashion. There are several posing tricks to help you accomplish this. I placed my model's body slightly behind the wooden post from her childhood outdoor gym. This essentially "hides" a portion of her body from the camera's view. Although this young model is quite thin already, this posing technique is very useful when photographing larger people. Also, the position of her arms separates her torso into two sections, also making her appear smaller. Turning your model somewhat sideways, as described in the first tip also will make your subject appear thinner from the camera's perspective. This is a technique I use often in portrait photography as well many other kinds of picture taking activities such as landscape and nature photos. If you've had a chance to browse this web site for related articles on composition, you'll find many examples of this. In this photo, I had my model climb into the center area of a small tree near in her front yard. While you're looking at the image, check out the beautiful, soft lighting. Her face is framed in by her arms, crossed in front of her on a small branch and also by the main trunk on her left. 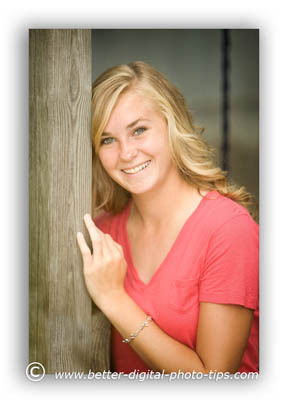 It also helps that she wore a long sleeved brown shirt which matches the color scheme of this outdoor portrait. Using these 3 photography portrait tips alone will make a big difference in your picture taking abilities. Look for more posing techniques for individuals as well as for group portraits in some of the other digital photography tips articles. 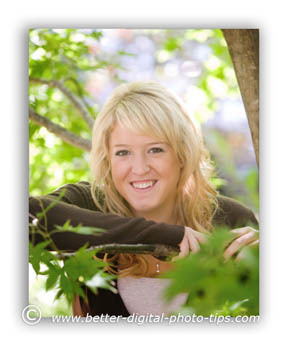 Here is an extra bonus photography portrait tip that makes a huge impact of your final image. Pay attention to color scheme. My senior model wanted to wear this white blouse for her portrait session. I found a spot on her front porch where the lighting was pleasant. 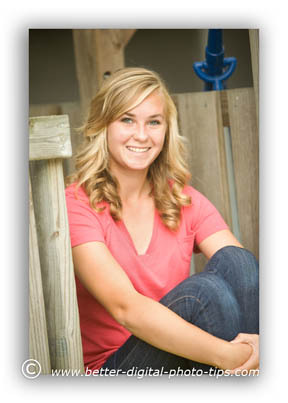 I found an angle where a white picket fence was behind her and used a wide open aperture to get a blurred background. In this particular portrait pose, the white blouse combined the white background help emphasize the colors of my models face and hair. This is one article in a series of many articles on photography portrait tips for individual models as well as group and family portraits. Dive in! Group Portrait Tips. 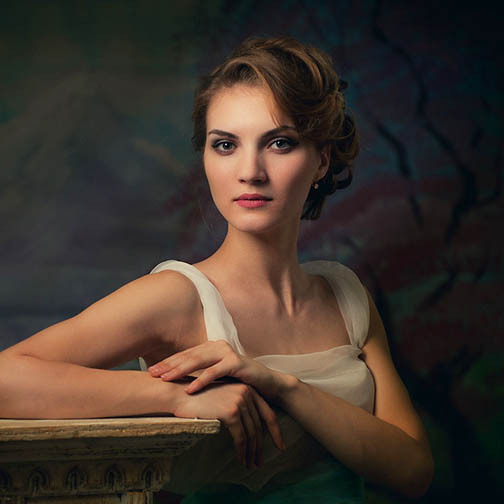 This article gives tips on group photography portrait posing. How to space your subjects and use geometric shapes like triangles to get winning family portrait poses. Baby Poses. The posing of babies is quite different then posing of an individual adult. Simple lighting and simple posing make for great baby poses. Portrait Photography Books. I've accumulated a small library of books on photography, including books on portraits. Portrait Photo eBooks. Now that e-readers like Amazon's Kindle and Barnes & Noble's Nook, and Kobo Clara, have become so popular and easy to use, ebook sales are exploding and photography ebooks are too. Portrait Lighting. It always comes down to how you light your subject with any type of photography you do. Get the 3 basic considerations of lighting you need to know about. Go to Portrait Photography Tips. This is the main post on portrait photography which will lead you a plethora of resources on portrait photography. Shoot more photos so that you can shoot better photos.